Custom shower doors offer the perfect solution for dramatically transforming your bathroom at a fraction of the cost of a full renovation. With more than 50 years of experience throughout New York and New Jersey, Monsey Glass specializes in providing quality custom shower doors to help you modernize your interior. Whether you’re looking for a sleek, minimalist design or a complex panel enclosure, you can rest assured you’ll receive a one-of-a-kind precision fit no matter what you have in mind. Available in a multitude of textures, styles, and colors, our shower door options are highly versatile and customizable to fit each homeowner’s unique aesthetic. Our exquisite glass doors boast a timeless quality that complements every look, from modern luxury master baths to eclectic, country-style washrooms. And, with our commitment to superior quality, the shower doors you choose now will last you for years to come. Why Upgrade Your Bathroom With Monsey Glass Custom Shower Doors? Showers are among the first features people notice in your bathroom. As one of the room’s key focal points, this area deserves the greatest level of attention. Whether you’re performing a complete overhaul or you’re simply looking for a simple, economical way to improve appearance, custom shower doors are a must-have component of any bathroom project. For over half a century, Monsey Glass has been outfitting the homes and businesses of New York and New Jersey with durable, attractive doors and windows. One of our specialties is crafting custom shower doors fit to your specifications and desires. Discover how our doors could transform your bathroom below. Traditional shower curtains drastically close off your space, which is particularly problematic for small bathrooms. Glass doors, on the other hand, dramatically increase the visible area of the room, making it appear much larger. Traditional shower curtains are notorious mold magnets. Mold spores aren’t just off-putting and foul-smelling; they can also contribute to respiratory issues when breathed in regularly. When a shower curtain accumulates mold, it has to be replaced, which can add to your home’s maintenance costs over the years. Glass, conversely, is less prone to mold development. To maintain a sanitary surface, simply wipe your doors down regularly – that’s all it takes! The average cost of a complete bathroom remodel exceeds $10,000 (homeadvisor.com), but you don’t have to shell out thousands of dollars to make a powerful visual impact. Custom shower doors are a wise investment for homeowners, as they serve as both a functional and aesthetic upgrade you can enjoy for decades. Most importantly, the Monsey Glass difference will allow you to enjoy additional cost savings, quality, and professionalism. We focus on aesthetics, functionality, and safety to deliver dependable solutions you can count on. Get in touch with our team today to start discussing your project! Quality is, in fact, one of the primary reasons New York and New Jersey homeowners turn to Monsey Glass. 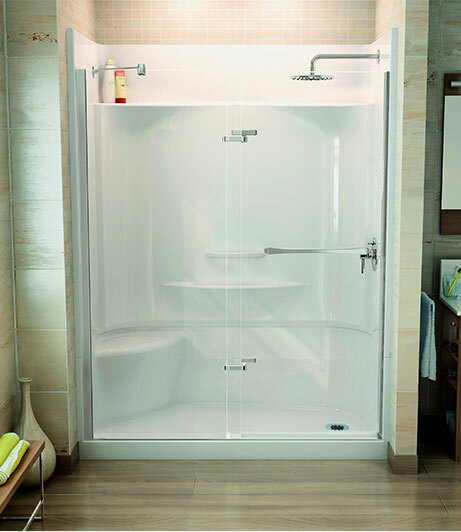 While you could purchase flimsy, prefabricated shower doors, Monsey Glass offers resilient, well-made products that will stand the test of time. Better yet, your new glass doors will be a breeze to clean: not only does glass beat out traditional shower curtains in terms of mold resistance, all it takes is a simple wipe-down to unveil crystal-clear surfaces. Most importantly, you can trust in the integrity of Monsey Glass. Both our residential and commercial clients are consistently pleased with our timelessness, quality of work, and fair prices. We know that the secret behind a flawless bathroom design lies not only in aesthetics but also in supreme functionality and safety. That’s why we take the time to make sure every installation is performed with the ultimate level of precision. If you’re ready to begin discussing the shower doors you’ve always dreamed of, contact the team for Monsey Glass to get started!